Address: 18/18, Bangna-Trad Road, k.m.18, Bangplee District, Samut Prakarn, 10540, Thailand. 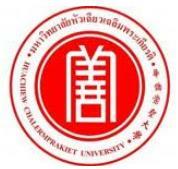 Huachiew Chalermprakiet University (HCU) is a university located in Samut Prakan, Thailand. Huachiew Midwifery School, founded by the Poh Teck Tung Foundation, began offering nursing and midwifery training in 1941. It became Huachiew College with a single faculty in nursing in 1981 and expanded into a university in 1992 under its current name. The university today is organized into nine faculties and a graduate school. Faculty of Public Health and Environment. Faculty of Social Administration And social welfare. Faculty of Chinese language and culture.